To quote Voltaire, or if you prefer, Uncle Ben from Spiderman, ” With great power, comes great responsibility.” When we choose to bring other animals into our families, we have the power to either make their lives amazing or to completely destroy them. We take on the responsibility of caring for them to the end of their days and they have every right to be treated with respect, dignity, and love. Health and safety are two responsibilities that we cannot shirk when taking care of another living being. When talking about safety for dogs, I think we should begin with identification. In general, you should have some form of ID on your dog; however, this is extremely important when you are traveling. Collars or harnesses with tags are a quick way for people to recognize that the animal they see belongs to a family. While it is nice to know the name of a dog, it is vital that an up-to-date address and phone number be printed on the tag. Also, the rabies vaccination tags can link dogs to their family by contacting the veterinarian office which administered the vaccine. It is possible, however, that the collar may not have been on the dogs neck at the time of separation or the collar later slips off. Keeping this in mind, you may want to consider getting your dog microchipped. Microchips provide a permanent method of identification, which, when scanned by a vet or animal control officer, provides the name, address, and phone number of the animal’s family. If you are interested in going this route, please contact your veterinarian for more information. I also suggest keeping a few current photos of your dog with you so that you both show people what the dog looks like so others know what to look for and proves a found dog actually belongs in your family. Since many of us own a cell phone with the ability take and store photos, this may be the easiest location to keep these types of pictures. In the event that you are separated from your pup, the Humane Society of the United States has some tips on how you can try to locate your furry family member. Visit http://bit.ly/HumaneSociety_LostPets, for more information. For even more tips, check out the list of websites the Humane Society references on the page I referenced. A hydrated dog is a happy dog! Provide plenty of cool water for your dog to drink at all times. Check out the article, “Hydrate your hound for health,” by Wendy Wilson at http://bit.ly/CesarsWayHydrate. Wilson writes that an average dog would, in general, need to drink about 8.5 to 17 ounces of water for every ten pounds per day. This amount can vary based on the dog’s individual activity level, age, and the weather conditions. You should also combine water with a lot of shade for a comfortable dog. It is even better if that shade is inside of an air conditioned home. Most of our dogs do not wear shoes when they go out. With that in mind, try to keep your walks to grassy pathways. According to PETA (People for the Ethical Treatment of Animals), asphalt temperatures can get to approximately 140 degrees just on an 87-degree day (http://bit.ly/PETAHotDogs). This ground temperature is hot enough to burn paws, possibly causing permanent damage and scarring. To give you a better idea of just how hot asphalt can be, a ground temperature of 135 degrees is high enough to cook an egg in five minutes. Please use caution when walking your dog and plan your route accordingly. No matter where you are, in the case of any canine medical emergency, it is also important that you know where the emergency animal hospitals are located. I would suggest doing an internet search for facilities which are open 24 hours a day and 7 days a week. If there are no places meeting that description in your area, look for normal vets and after hours clinics. Hopefully you will never need emergency medical assistance for your pup; however, you will be able to rest easier knowing that a trained professional is nearby. “I will only be gone for a few minutes,” and “It isn’t that hot out,” are thoughts which can turn into a death warrant for your beloved dog. Every year we hear about the deaths of canines around the nation who were left in parked cars unattended. According to PETA, in less than ten minutes, the inside of your vehicle can reach approximately 109 degrees on a 90-degree day. Even a comfortably warm day can turn deadly in a parked car (http://bit.ly/PETAHotDogs). Simply put, HOT CARS KILL! Please, have a responsible adult, with access to the car keys, stay with the dog in the car while you go inside to run your errands. If you are alone, you may need to reconsider taking your dog with you unless you are able to take them inside with you or are able to keep them in an air conditioned area with access to water. It is miserable to be hot, so why would you want to trap your dog in a oven on wheels? Just remember this, in a mere 15 minutes, dogs can suffer brain damage or die from heatstroke. We all would like to think that our pets are invincible; however, dogs can be just as susceptible as humans or more to the effects of heat. In fact, according to Priority Pet Hospital in Arizona, dogs experience the same symptoms as humans for heat cramps and heat exhaustion (http://bit.ly/PPH_HeatStroke). Since our dogs cannot speak to us with words, these symptoms are often missed. Symptoms of heat cramps and heat exhaustion include: headache, fatigue, lightheadedness, thirst, cramps, and nausea. The even scarier symptoms occur when dogs begin to experience a heat stroke. These symptoms are easier to notice; however, they are even more deadly. These symptoms include: incessant panting; restlessness; weakness; difficulty walking; drooling; vomiting; bright red, purple, blue, or grayish gums; collapsing; seizures; bruising which begins as a series of tiny bruises; and bloody diarrhea. If your dog is ever experiencing any heat-related illness, it is important to treat immediately. It is extremely important that you get your dog to a vet’s office as soon as possible. For a list of what to do and not to do when treating your dog for heat-related illnesses, visit Priority Pet Hospital’s webpage for detailed information (http://bit.ly/PPH_HeatStroke). The website, iheartdogs.com, has a list of the top ten dog breeds which are the most susceptible to suffering from heat stroke. These dogs will require a little extra care during the hot months. Check out the list at http://bit.ly/10DogsBreedsHeatStroke. We bring dogs into our lives for different reasons. Some of us are looking for a furry family member, others a work-out buddy, and for many other purposes. Though the reasoning may be different, all dogs deserve to feel safe, happy, and healthy. 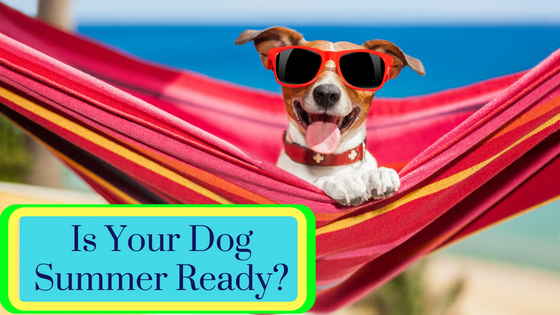 While planning your summer activities, keep your dog’s needs in mind, and make any necessary adjustments to ensure the well-being of your pup.